Q. What are varicose veins ? Varicose veins are swollen, twisted and unsightly veins (usually on the legs) that look lumpy and bluish through the skin. They happen when the valves in the veins become weak or break, allowing blood to collect in the veins just under the skin instead of being carried up to the heart. If left untreated, the poor circulation associated with varicose veins can lead to skin problems, such as eczema and ulcers, and they may bleed heavily if a prominent vein is injured. Varicose veins do not tend to get better without treatment, and usually get worse with time. The most effective treatment for many varicose veins is to have them surgically removed. Varicose veins are usually removed under general anaesthesia, which means you will be asleep during the procedure. The procedure is routinely done as a day case. However, you may need to stay in hospital overnight, particularly if you are having operations on both legs. Your surgeon will explain the benefits and risks of having your varicose veins removed, and will also discuss the alternatives to surgical treatment. Depending on how severe your varicose veins are, a non-surgical treatment might be sufficient to treat them. Resting with your legs up (with your feet higher than your hips). Wearing properly fitting elasticated compression stockings. Losing weight, if your doctor tells you that obesity is making the problem worse. Sclerotherapy - an injection of chemical solution into the vein. For large veins, a foam is sometimes injected, and this is called foam sclerotherapy. If successful, it closes the affected vein off, forcing other stronger veins to take over the job of circulating the blood. New treatments using microwaves, delivered by a fine tube inserted into the veins (eg VeinwaveTM). This causes the affected veins to collapse and shrink. It is available at some hospitals, but is not routine treatment. New treatments that heat up the affected veins, causing them to collapse and shrink. These include radiofrequency ablation (such as VNUS closureTM) and using lasers (endovenous ligation treatment). These are delivered to the vein by a fine tube. Your doctor will tell you more about these treatments and which ones are most suitable for you. The most effective treatment for many varicose veins is to have them surgically removed. However, it is possible that the condition will come back again, even after surgery. The hospital will send you a pre-admission questionnaire. Your answers help hospital staff to plan your care by taking into account your medical history and any previous experience of hospital treatment. You will be asked to fill in this questionnaire and return it to the hospital. If you normally take medication (eg tablets for blood pressure), continue to take this as usual, unless your surgeon specifically tells you not to. If you are unsure about taking your medication, please contact the hospital. Remove any make-up, nail varnish and jewellery. Rings or earrings that you prefer not to remove can usually be covered with sticky tape. Follow the fasting instructions in your admission letter. Typically, you must not eat or drink for about six hours before general anaesthesia. However, some anaesthetists allow a few sips of water until two hours beforehand. Many hospitals operate a strict no smoking policy. If you are a smoker, you may wish to bring nicotine patches to use for the duration of your stay. At the hospital, your nurse will explain how you will be cared for during your stay and will do some simple tests such as checking your heart rate and blood pressure, and testing your urine. You may be given an injection of a blood thinning drug called heparin before surgery to help prevent blood clots forming in the veins of your legs (deep vein thrombosis, DVT). Your surgeon will usually visit you before your operation. This is a good time to ask any unanswered questions. If you are happy to proceed with the operation, you will be asked to sign a consent form. This confirms that you have given permission for the procedure to go ahead. The exact method used to remove varicose veins can vary. A commonly performed technique, called ligation and stripping, involves tying off and removing the main vein affected in your leg. Two small cuts (about 5cm long) are made, one in the groin at the top of the main vein affected and one near your knee or lower down near your ankle. 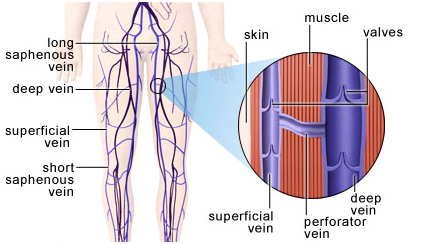 The top end of the vein near your groin is tied to stop blood flowing through it. Then a flexible wire attached to a special tool at one end is passed through the vein. The wire, along with the vein, is carefully pulled out of the leg through the lower cut. Sometimes the vein is tied off but not removed. Your surgeon will usually also make several tiny cuts (about 5mm long) on your leg to remove smaller veins. The cut in the groin is usually closed with stitches, and any small cuts on your leg are sealed with fabric strips. Your legs will then be tightly bandaged. You will be taken from the operating theatre to a recovery room, where you will come round from the anaesthesia under close supervision. After this, you will be taken back to your room, where your nurse will check your heart rate, blood pressure and blood circulation in your legs at regular intervals. You will need to rest until the effects of the anaesthesia have passed. Your leg may feel stiff and sore, and you may need painkillers. Please discuss any discomfort with your nurse. When you feel ready, you can begin to drink and eat, starting with clear fluids. Before you go home, your nurse will give you advice about caring for the healing wound(s), hygiene and bathing. The nurse will also give you a contact telephone number for the hospital and a date for your follow-up appointment. You will have bandages on your leg. You should leave the bandages in place until your follow-up appointment. These apply pressure to assist healing. You may also be given compression stockings to wear on your legs. These should be worn as advised by your surgeon. If you need them, continue taking painkillers as advised by the hospital. General anaesthesia can temporarily affect your co-ordination and reasoning skills, so you should not drink alcohol, operate machinery or sign legal documents for 48 hours afterwards. You should not drive until you are confident you could perform an emergency stop without discomfort. If you are in any doubt about driving, please contact your motor insurer so that you are aware of their recommendations, and always follow your surgeon's advice. Your treated leg is likely to feel sore, so you will need to take it easy. Do not stand still for long periods of time. During the first two weeks, try to take short (half hour) walks at least three times a day. This helps to loosen your joints and muscles, and will help speed up your recovery. When sitting down, make sure your feet are higher than your hips. This stops blood pooling in your leg and reduces the pressure on your healing wounds. Your recovery time will depend on whether one or both legs have been treated and the exact procedure used. Ask your surgeon for specific advice. Removing varicose veins is a commonly performed and generally safe surgical procedure. For most people, the benefits, in terms of improved appearance and reduced discomfort, are greater than the disadvantages. However, all surgery carries an element of risk. This can be divided into the risk of side-effects and the risk of complications. These are the unwanted but mostly temporary effects of a successful procedure. After surgery, your legs will be sore and bruised and the wounds may bleed a little. These side-effects should settle within a week or two. Scarring will usually fade with time, but won't disappear completely. Ask your doctor to explain how these risks apply to you. The exact risks will differ for every person. This is one of the reasons why we have not included statistics here.